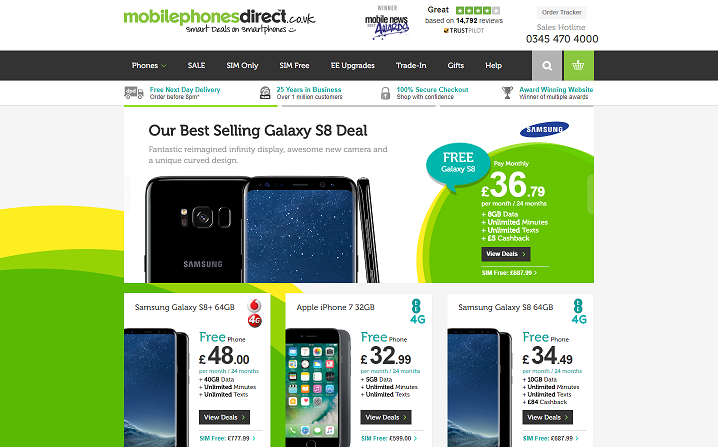 Sign up for free and just shop with Mobile Phones Direct as normal. Our members earned £10,000+ at Mobile Phones Direct in the past month. Any deal ordered from the sales page will not be eligible for cashback. Mobile Phones Direct cashback can be earned simply by clicking through to the merchant and shopping as normal. Mobile Phones Direct Cashback is available through TopCashback on genuine, tracked transactions completed immediately and wholly online. Cashback will track at a lower amount and uplift once confirmed on Contract Upgrade purchases. Browse the latest and best mobile phone deals from all major networks and manufacturers and keep in touch for less with our Mobile Phones Direct cashback offers. Search their bestsellers or shop by type, whether you are looking for a pay monthly contract, and EE upgrade or SIM free mobiles, while you can also view by brand, network or operating system. Not only do they offer next day delivery and phone insurance, but customers purchasing new pay monthly contracts or upgrades will be offered one of a range of free gifts, including televisions, laptops, games consoles, tablets and MP3 players. You can spread the cost of your purchase as they offer a finance option, while you can also trade in your old phone. If you are looking for a new mobile phone, you will find great deals on an extensive selection of 4G pay monthly contracts on major networks such as Vodafone, EE and Three. You will discover the latest handsets from brands such as BlackBerry, HTC, LG and Sony, while to can get your hands on the Apple iPhone 6S or the Samsung Galaxy S8 or S7. Whether you need unlimited minutes to make calls or a large data allowance per month for streaming, downloading or social media, you will find tariffs offering unlimited texts from as little as £8 a month for 12 or 24 months. Mobile Phones Direct also offer pay as you go, SIM free and SIM only deals, while all phones are available with one month's free handset insurance and technical support. As well as handsets, you can also purchase various accessories, including cases, covers, in-car chargers, memory cards and Bluetooth headsets. Buy a new handset from Mobile Phones Direct and you can trade in your old one. Just tell them about your old phone when you find a new one and apply your trade-in before choosing the right deal. They will send you a postage pack with your new phone and you will get paid via bank transfer the same day they receive your trade-in. You will need to provide details of your old phone's make and model, as well as the condition it is in, which will be verified when they receive it. If it does not match your description, they will send you an email with a revised offer, which you will need to accept or decline. You can choose to spread the cost of your purchase thanks to a finance option which offers a structured repayment plan at a fixed rate. Payments will be collected by Direct Debit each month for the period of the loan and the date of your first payment will be included in the credit agreement. You have the right to cancel the credit agreement within 14 of the day after it is made live. To exercise the cooling off period, you must contact Mobile Phones Direct to arrange the return of your product. You will need to pay a deposit during checkout, after which your application will be sent direct to Freedom Finance, who will provide you with a real-time decision. You can change your monthly repayment date any time during the loan term, while you can choose to pay off your loan early. Order before 8pm Monday-Saturday and your item will arrive the next working day - subject to availability and a successful network credit check. Orders placed after 8pm on Saturday, or on Sunday, will be delivered on Tuesday. You can track the status of your order by logging in to your account, while you will also be updated via email. When your order is ready to send out, you will be sent an email containing an order tracking reference number which you can use to track your order via the UKMail website, while they will also provide you with a one-hour delivery slot. If you are not in to receive your order, just visit the tracking information on the UKMail website and you will be able to reschedule delivery within five working days. If you are unhappy with a purchase, or simply change your mind, you can return it for a refund or exchange within 14 days of receiving it. If you receive a faulty item, you have an extended 30 days in which to arrange a return or exchange. Any phone you send back must be in a resaleable condition and in its original and undamaged box and packaging. The protective film must still be applied to the handset, while you must send back its original charger, leads and any other item which was in the box. You must also return any additional gift you received with the contract, while you will need to remove any pin lock or passcode personalisation and return the phone to factory settings. Gifts must also be unopened, unused and in the original undamaged packaging. To return a faulty handset with Mobile Phones Direct's returns policy, you should complete the form you will find a link to on the returns page, or contact them by email or telephone. Mobile Phones Direct Ltd work hard to source the latest handsets with special permissions to launch selected variances earlier than competitors. Plus, customers enjoy free next day delivery and a level of customer service that is second to none (as rated by Trustpilot). Use a Mobile Phones Direct promotional code or cashback to save across a range of top brands including Apple, Microsoft, Sony, Samsung, LG, HTC and Blackberry and leading offers from most of the networks available.